It doesn’t look like a production version is comming but we won’t give up hope. When I first saw the pictures of the VW Dune Buggy, I thought it was a prop for some upcoming sci-fi movie. Tron II – Electric Tron-a-Loo or something. But no, VW is serious. Or as serious as you can be with a show car. Which is what the Dune Buggy is. You’ll be able to see it at this year’s upcoming Geneva show. There were little vans, Porsche-like speedsters, crazy race-car-looking things, and of course, endless variations on the #DuneBuggy. Just like the originals, this Dune Buggy has no fixed roof or conventional doors, and the open side sills dominate the overall look. The wheels and off-road tires are large and borderline goofy and cartoon-like. Anyway, I’d love to stay and talk, but I heard there’s a big swell heading for Steamer Lane, so I gotta run. 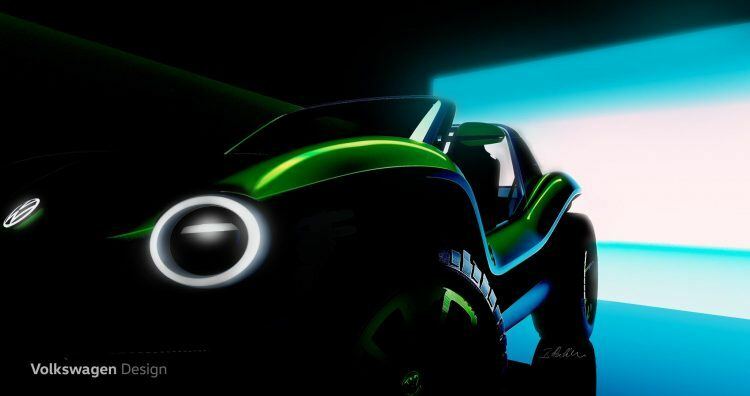 In the meantime, you can catch the Dune Buggy in person during the Geneva Motor Show which begins on March 7th. Later brah!